1.1 Required Formulas in boiling house stock calculation. 1.2 Online Calculator for Boiling house stock calculation in sugar process industry. Stock Calculations is one of the important duty in first hour of the day and lost hour of the shift in sugar process industry. Required Formulas in boiling house stock calculation. This formula is used for calculating the available sugar from the raw material or from the other material. S =Purity of Sugar or final product. J =Purity of initial material or purity of raw material. M = Purity of molasses or by-product. In factory working generally stock of material is taken volumetrically then its sample is analyzed for Brix, pol, and purity. From reference table density of the material is found out from the brix. Then the sugar in the original material is calculated and to that figure the SJM formula is applied. For simplification of the formula Putting the value of sugar purity as 100. = [Solids in final product (Final Molasses) x 100 ] / Final Molasses Brix. = [ (Solids in original material – Available Sugar) x 100 ] / Final Molasses Brix. 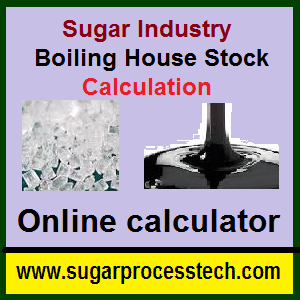 Online Calculator for Boiling house stock calculation in sugar process industry.